No, I didn't really say that out loud. I live in Florida *and* I value my life. But my Mom's buckeye candy is a totally non-partisan delight. If you've never had a buckeye, I'm sorry. I don't make them year round because they are kind of time consuming. Ok, very time consuming. But the hardest part is the rolling, and you can do that while watching a movie. Notes - Do not get fancy, natural peanut butter. We grew up poor and ours came from the huge tubs they sold at Kroger's. 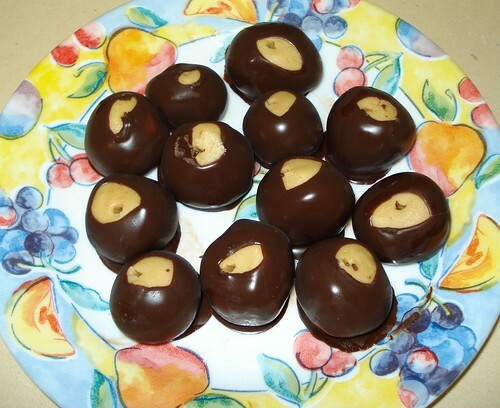 Cheaper peanut butter makes better buckeyes. I have tested this theory. Mix melted butter, peanut butter, vanilla, and sugar in a large bowl. You will probably have to use your hands for this. Form into 1 inch balls and refrigerate for at least 20 minutes - I like to do about an hour in the fridge. Using a double boiler, slowly melt together the wax and the chocolate. Line a cookie sheet or two with wax paper. When the balls are hard, use a toothpick (or a plastic fork with all but one tine broken off) to dip the balls in chocolate, twirling to let the excess drip off. Place on wax papered cookie sheets. Refrigerate until firm.